by a contestant registered before May 1st. The 2018 tournament 81 boats competed in the Big Croaker Tournament today run out of Garretts Marina. 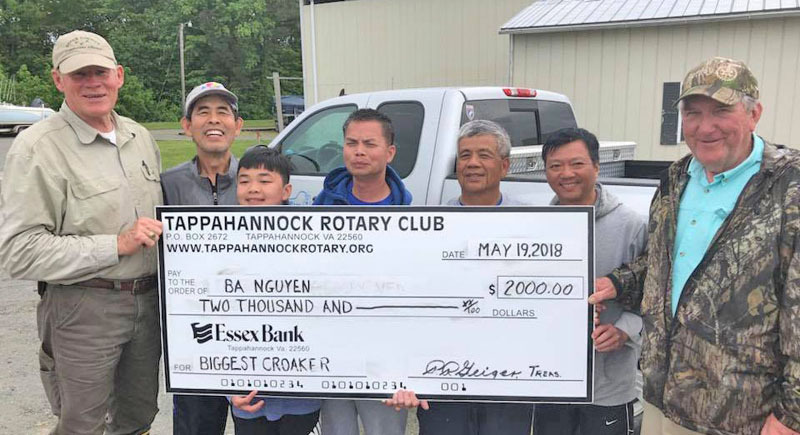 Ba Nguyen who has won four times over the last few years won first prize with a Croaker weighing 1.05 lbs! Caught near the pylons using shrimp. Ba won first prize of $1500 plus the early bird bonus of $500. Youth angler on Ba Nguyen’s boat, won second prize in the youth category for another $200. Check for first prize is presented by (left) Carl Strock - Tappahannock Rotary President), Hong Nguyen, Ba’s son Khang Nguyen who won second prize in the youth division, Ba Nguyen (center), My Ho and Loc Truong all of Springfield VA with his family and (right) Jim Wawner Tournament Weigh-Master. Not pictured Jay Brimmer, Tournament Chair. 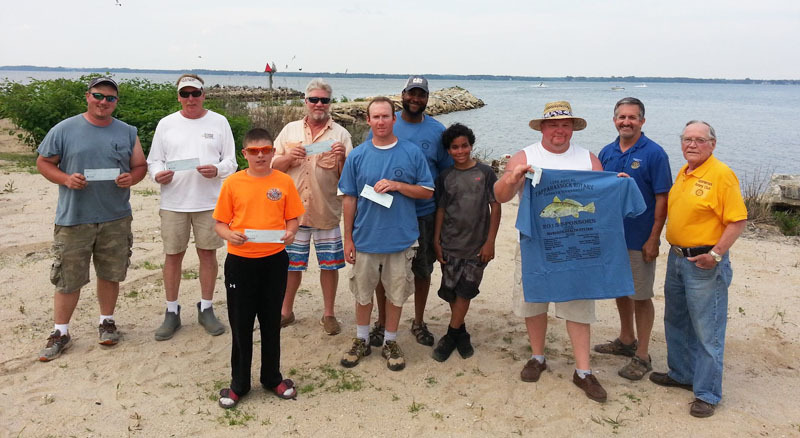 The 2017 tournament winners are: First prize: Jeff Robinson – a returning participant in the tournament from Mechanicsville, VA with a 1.35 lb croaker won $1,500 – his croaker was caught near Downing Bridge using crab bait; second place: Ba Nguyen of Springfield VA with a 1.20 lb croaker won $1,000; third place: Danny Greene of Clover VA with a 1.20 lb croaker won $500. Fourth place: Samuel Harris of Fredericksburg VA brought in a 1.20 lb croaker and fifth place: Son Nguyen of Springfield VA caught a 1.20 lb croaker. Jeff Robinson was also the major winner of several cash prizes for the tournament within a tournament. Contestants with tied weight winning croakers are ranked according to earliest entry date. 2017 Youth Angler winner under 16 Kevin Nguyen of Springfield VA with a 1.05 lb croaker won $300. 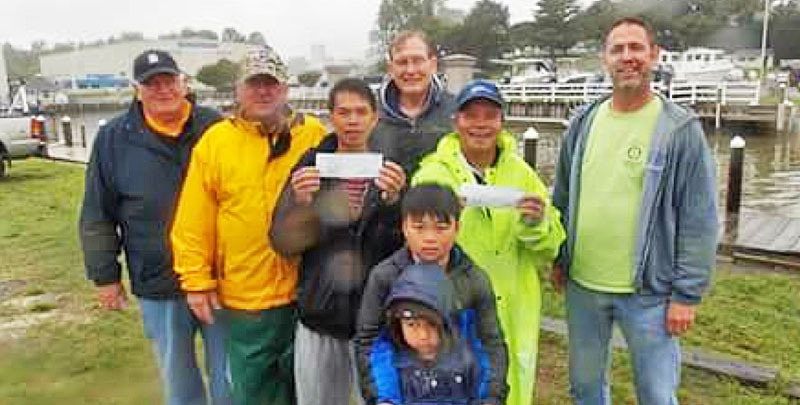 Second place was Kyle Selak of Fannetsburg PA who caught a 1.00 lb croaker winning $200, and third place was Leo Nguyen of Springfield VA also with a 1.00 lb croaker wins $100. 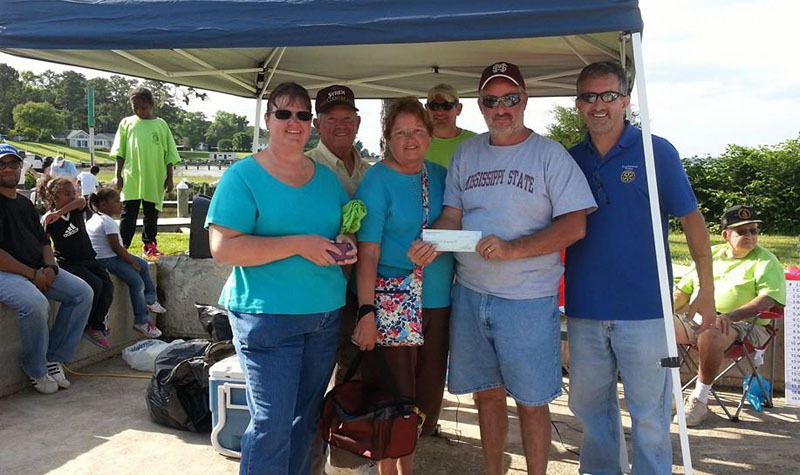 Jonathan Morris won the special prize of a fishing rod for fourth place. 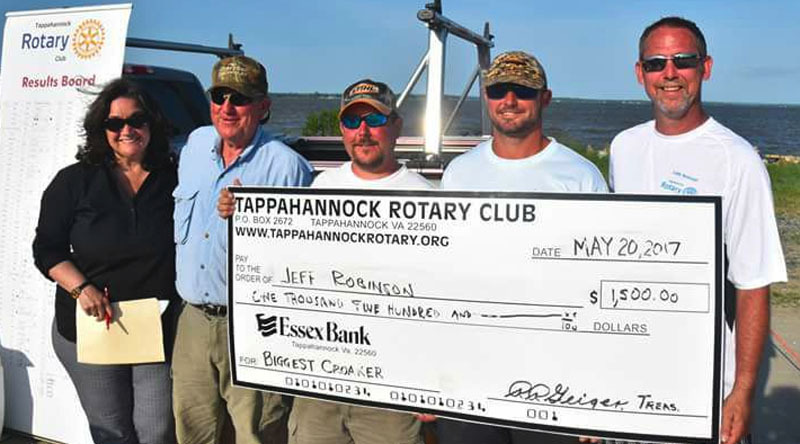 Winners of the $4,500 prize money in Tappahannock Rotary Club’s 2015 Annual Andrew Reavis Memorial Croaker Tournament held Saturday, May 16th: (l to r, 1st Place - Deral Wertz; 2nd Place – Robert Fenter; 1st Place Youth Division – Tye Morris; 3rd Place – Andy Davis; 4th Place Phillip Donnelly with crew Eric Montgomery and Morby Montgomery; 5th Place- Ronald Morris; Event Chairman, Bill Reavis; Tappahannock Rotary Club President, John Gregory; not pictured: 2nd Place Youth Division – Michael Johnson; 3rd Place Youth Division Brandon Corbin). The weather was perfect and the fish were plentiful (even if they were a little on the small side). Congratulations to our winners. Third Place - a three way tie with 1.25 lbs Josh Boyer, Ronald Moore, and Willard Hall. We made a mistake in awarding the third place prize under the tie breaker rules so we will be sending a check for the difference to Mr. Boyer for the earliest entry. Third Place - tied with 1.05 lbs, Thach Nguyen and Robert Berry. We also appreciate everyone's flexibility adapting to the change in weigh-in locations due to the construction at June Parker. We had good feedback from everyone about the experience at Garrett's Marina and would like your input for the weigh in next year. Thanks to Rick and Skipper Garrett and Louis Muse for being great hosts!